The OCSMR club in Lakewood, New Jersey has finally made our move from All Saints Episcopal Church in Lakewood where we have been located there since 1992. We vacated the church basement completely on September 24, 2016. We are now located inside Pine Park in Kuser Hall next to Lakewood Country Club and Maggie's restaurant off of West County Line Road on the Lakewood/Jackson border. Our club www.ocsmr.com is a dual gauge club with HO and O gauge combined in one club. Last night was our first meeting in our new home as a club. A little history behind why we made the move. Since we were located in a basement of a church that has been around for close to 90 years and we had a small problem with the last, not the current pastor, it was time to look elsewhere for a more secure location. The Lakewood Historical Society was renovating an old boys school built in 1927 to locate their newly opened Lakewood museum and offered the entire basement to our club when they heard we had an issue with the church. One of the folks on the historical committee was a past club member and a few folks on their committee actually have trains. When they offered the opportunity to us, we jumped on it. They had just signed a 50 year lease from the town with a 25 year extension as they were recreating the archives of Lakewood under one roof when Lakewood was a resort town back in the early 1900's. The museum has priceless memories in 10 gallery rooms that were used at one time as classrooms. Kuser Hall is 1 of 5 buildings that was left untouched which was the science and physics building. Lakewood tore down the other 4 buildings many years ago but left this one alone. It would have cost them too much money to tear it down. It is built like a fortress with poured concrete walls and bricked ceilings. The move did come with costs involved to our club. We had to fully renovate a basement of a school built in the1920's that ceased operation in the 1960's. No one has used the basement in 50 years and the historical society did the same renovations to the upstairs and outside which came with some costs. Any building built back in those days were made of poured concrete walls and built to withstand any rumblings from God!! All I can say it was a task that started 2 years ago for us with the result now that we have 2 operating layouts that are being landscaped ans scenicked. So... we have a nice association with the historical society. When they have their open houses, we do the same. It is a marriage made that benefits both and we are extremely happy to be associated with the Lakewood Historical Society. Very nice folks to share the building with!!! So our club will continue to be known as the Ocean County Society of Model Railroaders. Check our website and facebook page for updates, what we started out with at Kuser Hall and where we are at now. Congratulations on the a successful move! We are putting the finishing touches on our basement home at InfoAge Science Museum in Wall Township. I am not local, but I don't mind the drive. I'll contact you about a visit. I ran this train last week when I joined. My CNJ freight at its full length. My wholehearted congratulations to the people of OCSMRR on their new digs. I had the pleasure of being involved with this group for a couple of years and it was great. That's great news!! It sounds like a very good long term location. From what I understand the Midwest Independent Hi-Railers have a similar deal here in NW Indiana at a town's historical center. It really is a great marriage that helps both parties get more visitors. Enjoy the new space and keep those pictures coming!!! YOUR ABOUT INFO SHOWS YOU STILL LOCATED AT THE Church ! That is a nice O GAUGE Layout ! Our webmaster needs to update the site since there is no more layouts at the church basement. They have been torn down and the basement is emptied. I attached a picture of the O gauge room that we inherited from the very beginning at Kuser Hall! Wow you guys had a lot of work to do to turn that around!! But for $1 it sure was worth it. A LOT of members (both HO and O) put in a LOT of work to get where we are now. The O-gauge layout has the two lower loops of track operating. Will have two more loops that are over and under. Minimum curve is 071 and the max is 105. Below is a copy of the O-Gauge track plan. Where is the room for the HO Trains ? Your O Gauge layout takes up alot of space ! Looks to be nice layout once done . HO has their own room across the hallway from us. Our O gauge room is about 18 x 35 feet and the HO room is about 20 x 40 as they had the added area which was at first to be the kitchen/repair area for both. Plans did change and we were able to build a separate room for O Gauge repairs within a large room down the hallway which the museum converted into their repair/tool room. When the school operated, that entire room served as the coal bunker with the shute being still intact on the wall and the large coal furnace is right at the doorway there. 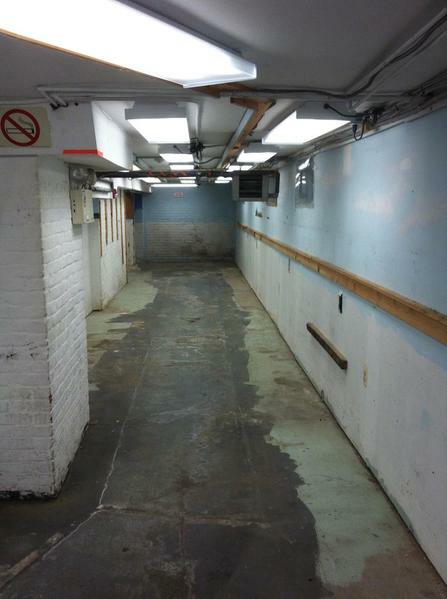 Also, in the basement is an original science room lab that they are going to restore. At each end of the hallway, we have 2 storage rooms/closets that we re-built the wood studded walls to keep our modular layouts, etc. If anyone is in the Lakewood, New Jersey area and wants to visit the actual museum, it is opened on Thursday, Saturday and Sunday from 1pm to 4pm. We do not have access to the museum other than those hours. They had their opening dedication about 3 weeks ago. If anyone wants to visit our club your best bet is to email me or Locobudd as the phone is not re-connected yet. 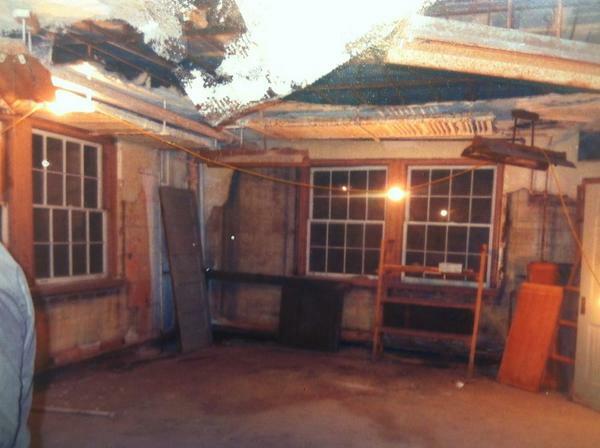 Also, both rooms were about the same condition when we started renovating. Hallway was not in much better shape. Many, many hours of sweat labor went into restoring those areas. Actually, the O-gauge room is 18 by 36 feet. The new layout occupies about the same area as the Church layout did. The shape and wider aisles make the size of the new layout somewhat smaller. The new layout has a shorter track run (about 150 feet per loop) but there are 4 loops instead of 3 as on the old layout (200 feet each). So, overall track run is about the same. The HO-gauge room is 18 by 32 feet. It was in better shape than the O-gauge room. Attached are pix of a recent shot of the O-gauge layout with the same view as the first pic and a view of the HO-gauge room viewed in about the same orientation as the first O-gauge pic. The O gauge layout photo that Bud just posted with the windows closed up in the rear is the same view of the room with my initial photo. QUITE A DIFFERENCE YOU THINK ? We took off about 5,000 pounds of plaster mixed with some concrete off the walls and ceiling, ran electric in the ceiling for the LED lighting, for the AC units and for the 2 ceiling fans. Then double painted all the walls and ceiling. One heck of a labor Job! You guys have come a long way. I can't wait to come see for myself. Wait I think I know you. Didn't you do work for my friend? A lionel postwar S2 Turbine? I think you gave him a break on the bill or something for a Christmas gift. So this is the way the cookie crumbles, eh Ted? 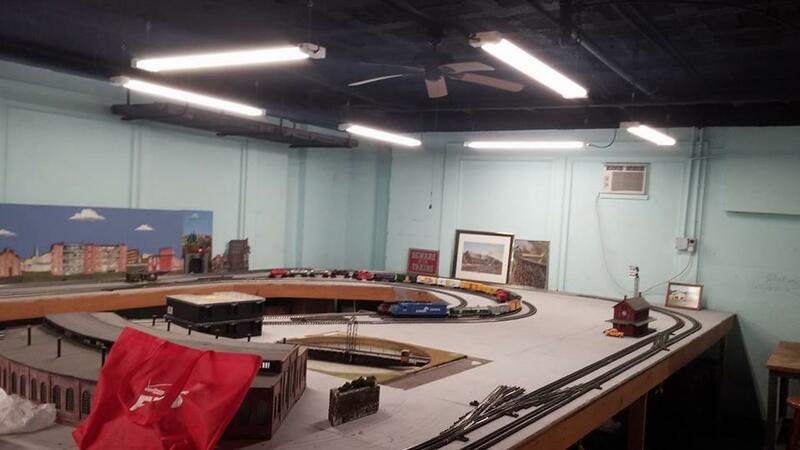 THE OCEAN COUNTY SOCIETY OF MODEL RAILROADERS • On your new location and your first class web page. That's certainly possible. Young guy just getting into the hobby? Yeah, I think he gave it to you at a train show in Milltown, NJ last year..
Today was our final goodbye to our church location which was home to us for the past 24 years as we emptied out the last of our belongings. Below is a picture from the O gauge side of the basement. This is from the HO side of the basement. Each side had a 60 foot run. Now, completely emptied. Never thought it would happen with 24 years of accumulation. A great job by the club members and others who have helped.Stay tuned for more updates.. Here're some pix of the deconstruction and prep of the O-gauge room. The guys hoisted a couple of tons of debris and steam pipe. It’s been a long time since we spoke but I wanted to thank you for your story covering the clubs move. As much as I like operating with our modular club, it would also be nice to have a more permanent location like you and your club now has. Don’t do as much traveling as I use to, but if I’m in the area I will be sure to contact you. Please keep posting updates when possible and have a great day. 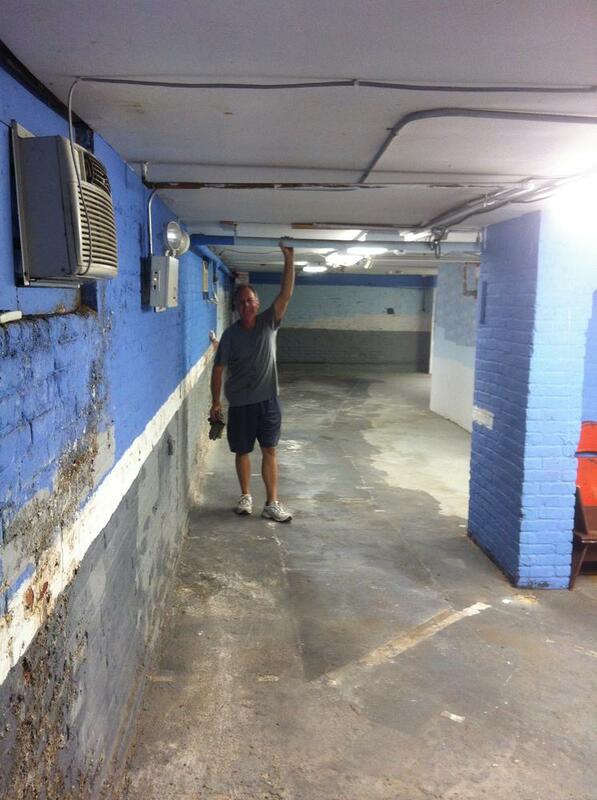 Our club always had a permanent location for the past 24 years in a church basement and we paid rent and utilities. We have moved to the new Lakewood museum that the Lakewood historical society has developed in Kuser Hall, an old boys school that stopped operating in the 60's and the building was pretty much left abandoned for almost 50 years. Then the township leased the building to the society for 75 years for a $1 and they heard about our problems with the church. They offered us the basement but we had to clean it up and renovate it which took many months, about 2 years worth of sweat and labor to get where we are at now. Our next project is soldering all the gargraves track on the 2- O gauge lines which we have done about 40% of them. We still have 2 more loops to build. Going to have 4 operating lines on this layout. 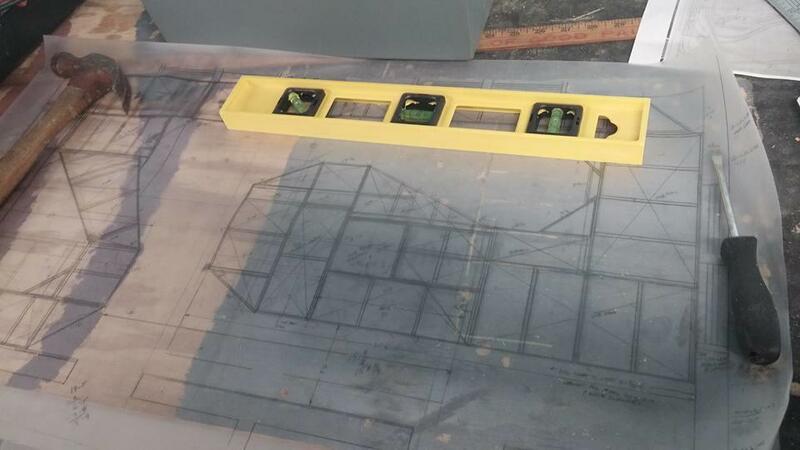 Some pix of the framing for the O-gauge layout. Youngest and oldest members. First section of layout installed. John, youngest member at 14 and Ed, oldest member at a young 84. Only 70 years apart. Both chipper and eager to get the layout done to run trains. 2 of the 4 operating main lines gargraves track is all soldered together. We started laying track for the 3rd operating line. We are slowly progressing after 2 weeks of unpacking and setting up our repair room. Congratulations!!!!! When is the first look? TCA, METCA, LCCA, LRRC, MTHRRC, Atlas Golden Spike Club Charter Member, Bergen County Model RRC and NJ HiRailers Member. With the framing complete, some pix of laying of the plywood. We ordered 1/48th size figures but we think the order got mixed up and sent us 48xs figures. That 48xs figure was looking to where he could make his tee shot from. PSU- anytime you are in the area, the invite is always open and welcome. We are able to operate 2 of 4 lines now. Pix to where we are now with trackwork. Plywood was covered with 2x4 ceiling tiles glued to the plywood with reverse side up. Track laying apprentice begins his training. Apprentice graduates at the top of his class. Fine tuning the position of the roundhouse. Hey, Ted...best of luck in the new location! Ted, Bud and the rest of the OCSMRR Crew - Looking great! I like the wider aisles and the over and under plan being carried on. Keep us updated with pics as you can. Paul - Kinda one dimensional in layout design. Tried to use what we could from the old layout (trestles were a nice feature and will be incorporated). The building architect for the historical society recommended 42 inch aisle spacing. Proved to be a good choice. Not as tight (or as friendly) as the old layout. Hope to see ya at York. Bud's apprentice aka "butch in training" has progressed through a few levels of training. Level one- track laying, bending curves on pre-cut forms, using the proper amount of screws to secure track to ceiling tiles. We only ordered 10,000 Screws! I am working with a Screw Ball! Level two- soldering rails together, wiring between the rail joints and soldering. Level three- cutting rails properly with Dremel tool ( just completed that training last Saturday). And so we go onto track #3. Should get interesting afterwards when we have to do the elevated part.